RedVector is happy to announce the launch of a brand new mobile-ready eLearning course! 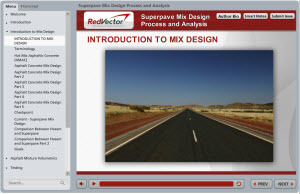 This RedVector course provides Hot Mix Asphalt materials engineers and/or materials technicians a better understanding of the Superpave mix design process and analysis. It will also provide a better understanding of volumetrics for those who perform mix designs (typically technicians) and those who analyze the data (typically engineers). By the end of this RedVector course led by Kwabena Ofosu (a Traffic Engineer in the Public Works Department for the City of Palm Bay, Florida), students will be able to describe the procedures involved in the Superpave mix design, recall how to select the proper materials for a Superpave mix, describe how Superpave mix is compacted, and define HMA Volumetric terms. RedVector is excited about the launch of this mobile-ready industrial course and has several other new courses coming soon. Be sure to follow our blog and check us out on Facebook and Twitter to stay up-to-speed on all the latest eLearning news and course launches! For more information about this or other RedVector courses, contact our client support department today.